Purina Rabbit Chow Fibre3® Formula Natural AdvantEdge® is a natural*, corn-free rabbit feed that provides superior nutrition for rabbits of all ages. 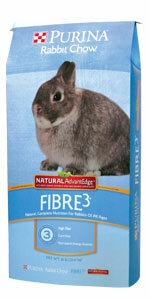 It helps younger rabbits get a great start and helps older rabbits maintain ideal body weight. Free of all fillers, preservatives and artificial colors, Fibre3® Formula Natural AdvantEdge® Rabbit Feed provides complete nutrition, giving your rabbits the feed they need for growth, health and longevity.